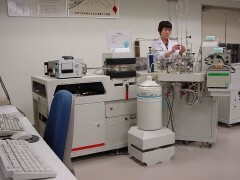 Dual inlet, triple collector IRMS (Isotope Ratio Mass Spectrometer) devoted for 13C/12C and 18O/16O ratio analysis using CO2 as a measuring gas. High precision δ18O and δ13C analysis of silicates and carbonates with precision better than 0.02 ‰. Refer to preparation systems. Sample size is normally 100 µl CO2, but 1 µl CO2 is possible with cold finger. A cracker manifold is attached for autorun of 10 samples. Automated δ18O measurement of water samples (24 samples a day) with precision better than 0.05 ‰. Role of water and CO2 in the study of magmatic hydrothermal systems. person(s) whom users should contact: Ryoji TANAKA.